Leh, Ladakh, J&K, India – This morning, after greeting the dozens who, wherever he goes, congregate to see his smile, hear his words of comfort, or feel his calming touch, His Holiness walked to the gate of Shiwatsel Phodrang compound. He climbed into a car to drive to the teaching pavilion at the far end of the teaching ground. Thousands lined to the way to greet him. Closer to the pavilion, local women in their finery, drummers, horn players, monks with their own horns and a ceremonial umbrella waited to welcome him. 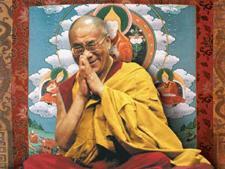 Just before entering the building he spent a couple of minutes consoling chronically ailing Tibetans. Once inside the pavilion, he saluted the statue of the Buddha, and, catching the eye of several old friends as he went walked down the edge of the stage, where from the centre, left and right corners he waved to the estimated 40,000 strong crowd. Having greeted Lamas and monks to his right he took his seat. Children from the Ladakh Public School who had been demonstrating how adept they are in debate sat down. Students of the Central Institute of Buddhist Studies then began a melodious chant of the ‘Heart Sutra’ in Sanskrit. “We’re going to continue this teaching from where we left off last year,” His Holiness explained. “We finished the first three chapters of ‘Guide to the Bodhisattva’s Way of Life’ then, so we’ll start now with Chapter 4 – Conscientiousness. The author, Shantideva, was a great master of Nalanda, a follower of Nagarjuna. I received this teaching from the Kinnauri Master Tenzin Gyaltsen, who assured me that no greater explanation of how to cultivate the awakening mind of bodhichitta had been composed since this book was written in 8th century. He taught it to me in 1967 and it has been very beneficial for my mind. He told me it would be good if I could teach it to others as often as I could. “Many people have gathered here, not for entertainment, business, or for a political rally, but for a spiritual teaching. What does that mean? Here in the 21st century all 7 billion people alive today want to be happy and not to suffer. We’re all equal in that. Many seek solace in religion, but 1 billion declare they have no interest, saying that religion is exploitative and unnecessary. All religious traditions commend the practice of love and compassion, which are a source of peace and happiness and warn of the faults of destructive emotions like anger and jealousy. “Scientists say they have evidence that those who cultivate love and compassion have greater peace of mind, while constant anger and fear make us uneasy and are bad for health. Common sense too tells us that people who are moved by love and compassion are peaceful and happy. Those overwhelmed by destructive emotions like jealousy and competitiveness feel the whole world is their enemy. It’s easy to see that love and compassion earn people’s trust and trust wins friends. Similarly, honesty and truthfulness are the basis of justice. 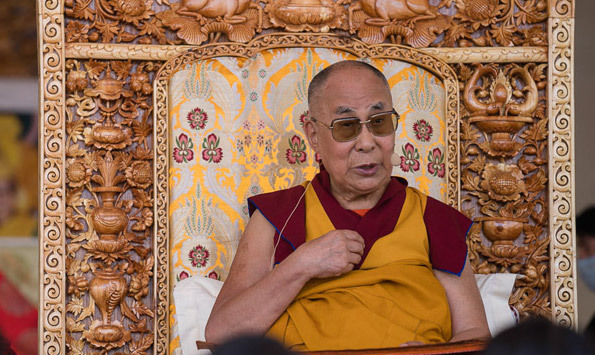 Seeing that the Ladakh Public School students who had debated earlier had no protection from the burning sun, His Holiness called them up to sit in the shade at the foot of the throne. He remarked that we cannot ignore what is happening to others, if there is something to be done. He added that these days educated people increasingly recognise that complacent neglect of the suffering of others reflects a lack of ethics. “For more than 1000 years since Buddhism was established in Tibet,” His Holiness declared, “we have kept the traditions we received alive. Today, I tell Indian friends and intellectuals that reviving ancient Indian knowledge of the mind and emotions would be both relevant and valuable. Taking up the ‘Guide to the Bodhisattva’s Way of Life’, His Holiness resumed his reading at Chapter 4, which deals with conscientiousness, the sense that once you’ have decided to do something, you should see it through. He noted where the verses refer to the value of a precious human life endowed with freedom and fortune, and how since things are impermanent it can be easily lost. Further on the text asks – how did I become a slave to negative emotions? Negative and destructive emotions are compared to interfering spirits, prompting His Holiness to remark that the best way to fend off such interferences is to cultivate compassion for them. Holding a strong grudge I shall meet them in battle! — It is like a pledge we should adopt. Reaching the end of Chapter 4, His Holiness stopped for lunch, promising to continue his reading tomorrow.